Canon is poised to unleash the Canon EOS 1100D (Rebel T3), a 12.2MP DSLR designed to replace the 10.1MP entry-level EOS 1000D announced nearly three years ago. 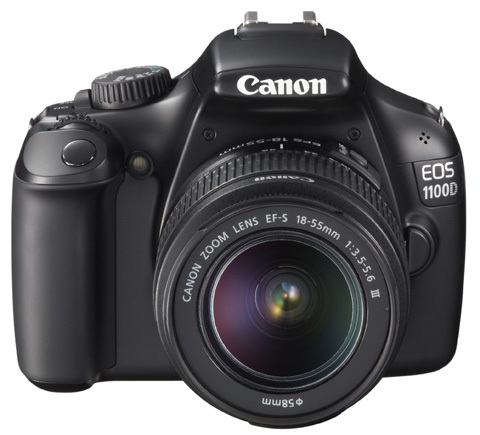 Canon is poised to unleash the Canon EOS 1100D (Rebel T3). The Canon 1100D is a 12.2MP DSLR designed to replace the 10.1MP entry-level EOS 1000D announced nearly three years ago. In 2008, Canon said it hoped its 1000D would trigger a digital SLR revolution among mass market consumers. Like the EOS 1000D, the Canon EOS 1100D is aimed squarely at the first-time user, a market which seems to have altered since the 1000D was launched. ?More and more women are buying into entry-level DSLRs, aged 25-35 years,? a Canon UK spokeswoman told AP. Featuring an APS-C-size CMOS imaging sensor, improvements over its predecessor include a 14-bit Digic 4 image processor, 9-point AF (7-point on 1000D) and a top equivalent ISO of 6400 (1600 on 1000D). Measuring 2.7in, the 230,000 dot screen is also slightly larger that the 2.5in monitor of the 1100D?s predecessor. Also added is HD video (720 pixel resolution), Creative Auto and Basic + (first launched in the 60D) models. AP?s hands-on first impression of the Vsnon 1100D suggest it has more chunkier, retro, feel than the 1000D. A Feature Guide (also included on the new, higher-end, EOS 600D) is added, to help beginners learn about their cameras as they use it. The 1100D uses the same 63-zone iFCL metering as the semi-professional EOS 7D model. Like the 1000D, the newcomer shoots at 3 frames per second. The EOS 1100D will cost £419 (body only) when it launches in the UK in early April.